The day after Halloween 2015 Phoenix Arizona got shaken up a bit when three earthquakes rattled some bones Sunday just before midnight. Black Canyon City was the closest population center (pop. ~2000) to the epicenter. The largest was a magnitude 4.1 and no damage was yet identified. 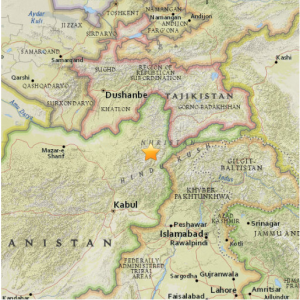 Another earthquake hit the country of Afghanistan on 2015-10-26 09:09:32 (UTC) according to the United State Geological Survey (USGS) (tinyurl.com/od3gobe). It registered M 7.5 on the Richter scale in the Hindu Kush region 270 km northeast of Kabul. The reverse fault movement was some 210 km underground, an intermediate depth. The destruction included some 4000 dwellings and killed at least 80 people. San Ramon has experienced what is being called a record breaking 408 earthquake swarm (tinyurl.com/qxw2yko). Located to the east of San Francisco bay, San Ramon is a community of approximately 76, 000 people. The swarm began on Tuesday, October 13, 2015 and continued through today (October 27) with a couple of minor quakes registering 2.0 or larger per day. The largest registered at 3.9 on the Richter scale at 4:21 PM local time on October 19. The earthquakes in this swarm occurred 5 or so miles down along the “Calaveras Fault zone near the north end of the Pleasanton Fault.” They were strike-slip quake events. This general area has a history of earthquake swarms with 120 over 31 days in 2013 and 351 over 42 days in 1990 near Alamo, CA. Minor shaking will likely continue over the next several weeks. A larger event is “unlikely,” however, a 6.7 or greater earthquake is 8% likely to occur sometime in the next 30 years. Patricia is now being called “the most dangerous storm in history” by the Mexican CONAGUA director, Robert Ramirez de la Parra. The coastal city of Manzanillo is bracing for landfall. This nighttime image from EUMETSAT shows the magnitude of this catastrophic storm. Eumetsat composite image of the Category 5 Hurricane Paticia. Copyright: 2015 EUMETSAT. Well, that is not exactly what they say – but it is close. Using data from before and after the 2014 M 5.1 La Habra earthquake, NASA developed a model of the main and surrounding shocks. GPS and Uninhabited Aerial Vehicle Synthetic Aperture Radar (UAVSAR) measurements showed “a broad pattern of deformation that would be expected of a M5.1 earthquake.” (tinyurl.com/putd88o) The six modeled “structures and slips” account for the estimated seismic moment, that is a measure of the amount of earth movement due to the quake. The authors stated that their modeled “results are consistent with north-south shortening and westward escape of the crust near Los Angeles.” Guess we continue the “go west, young man” (and woman) adventure. NASA continued the analysis by looking at the Gutenburg-Richter relation for earthquakes in the region from 1994 to 2015 and estimated that there is a 99.9% probability that another greater than 5 magnitude earthquake will hit before April 1, 2018. The probability that it will be greater than 6 is much less at 35%. But, still. All of this for an area within 100 km (60 miles) of the La Habra epicenter (Figure 1), which covers most of the greater Los Angeles area. The rational behind the estimate is that more pent up energy is buried deep and the 2014 shake left it unreleased. Figure 1. 100 km radius around La Habra, CA. This is not the first, and certainly won’t be the last, prediction of a big earthquake in Southern California. The USGS gives a 85% probability for the >5 M earthquake, for instance. More on that later. 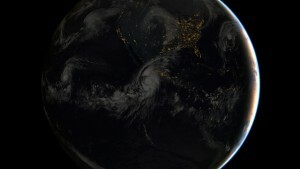 Hurricane Joaquin, which past over several island chains off the coast and buffeted the eastern US as far inland as Tennessee, brings to mind another watery weather event associated with the name Joaquin – this time on the opposite side of the continent. “While the rest of the country was engaged in an epic cataclysm of Civil War, California suffered through an unprecedented natural calamity, which was the most devastating recorded flood in California’s history – the Flood of 1861-1862” (tinyurl.com/ppv472b). The Great Flood of 1861-1862 actually extended from the Columbia River in Oregon into southern California. San Joaquin county sits just south of Sacramento, the capital of California, which had to relocate to San Francisco for a period of months afterwards. By all accounts, the Central Valley region was “inundated.” The records of the previous flood of 1853 were broken when the Sacramento River crested above the 22’6″ mark on December 27, 1861. This catastrophic flood, unlike the catastrophes from Hurricane Joaquin, were the result of several sequential weather events over the course of many months at the end of 1861 and the beginning of 1862. A combination of continuous rain over large swaths of the Northwest and significant melting snow pack from the mountains contributed to the massive amount of water that poured through the region sweeping away house, cattle, machinery, and men. One tragedy from Hurricane Joaquin is the presumed loss of the cargo ship El Faro and all souls on board. The search for answers is ongoing as Joaquin heads for the British Isles. NOAA track of Hurricane Joaquin Thursday, October 6, 2015. Websters defines “catastrophe” as 1 : the final event of the dramatic action especially of a tragedy; 2 : a momentous tragic event ranging from extreme misfortune to utter overthrow or ruin; 3 a : a violent and sudden change in a feature of the earth, b : a violent usually destructive natural event (as a supernova); and 4: utter failure : fiasco <the party was a catastrophe>. The concept of “utter failure” seems to cover it all in one way or another.